False codling moth | Infonet Biovision Home. It is small (wingspan of 16-20 mm), dark brown to grey in colour. The moths are active at night. 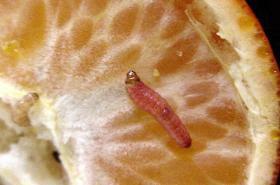 Female moths lay single eggs on ripening citrus fruits. 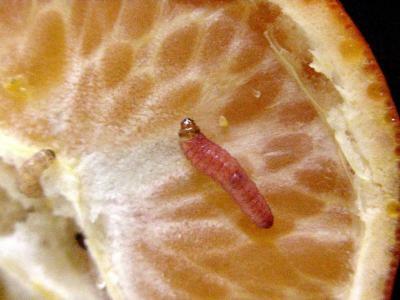 The young caterpillar mines just beneath the surface, or bores into the pith causing premature ripening of the fruit and fruit drop. 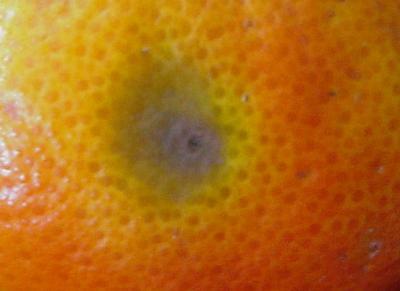 The initial symptom on the fruit is a yellowish round spot with a tiny dark centre where the insect entered the fruit. In a later stage brown patches appear on the skin, usually with a hole in the centre. The young caterpillar is creamy-white with a dark brownish head. With age the body turn pinkish red. The fully-grown caterpillar is 15 to 20 mm in length. When mature the caterpillar leaves the fruit and pupates in the soil or beneath surface debris. Navel oranges seem to be the most heavily attacked. Grapefruit is less susceptible. In lemons and limes larval development is rarely, if ever, completed. Proper orchard sanitation in combination with egg and larval parasitoids normally keep this pest under control. Infested fruits (both on the tree and fallen fruits) should be removed regularly (twice a week), and buried at least 50 cm deep, or dump in a drum with water mixed with a little used oil. The fruits should be left in the drum for 1 week. This moth also attacks cotton, maize, castor, tea, avocado, guava and carambola fruits. Other host plants include wild guava plants, oak trees and wild castor among others. These other host plants should be included in the sanitation programme. If possible wild host plants should be removed from around the orchard. This pest is recorded in many African countries.